It was like a harbinger of all good things that morning almost ten years ago when Beth Essick held a hummingbird in her hand. It is not known how or why Beth was allowed to cradle the tiny creature in her hand but we do know that it was not stunned and it was not sick. It responded to human touch as Beth rubbed its little head and stroked under its neck. Fortunately, Beth's dad, Dempsey Essick, had a camera handy and recorded the remarkable moment in time. Allowed to leave when he was ready, the small speedster circled Beth's head once then zoomed away. For Dempsey it was a good luck sign. How often, in a lifetime, do you have a chance to observe, up close and personal, one of nature's smallest birds? After developing and studying the photos of Beth and Bird Dempsey began to observe the tiny creatures more closely. This lead to him doing numerous hummingbird paintings and eventually even developing a gift line referred to as Hummer-ville, USA. As Dempsey Essick's popularity as the Hummingbird Artist has grown, so has the demand for his hummingbird art. 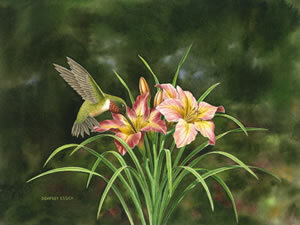 "Daylilies for a Day," features the male Ruby Throat Hummingbird hovering over two blossoms in the field of daylilies behind Ruby Potts' home in Advance. "In the world of flowers," Ruby said, "the daylily flashes on the scene for a day and is then gone." Ruby's field of lilies was the subject of two prior Essick paintings, "Daylily Days" and "Ruby's Daylily". In the painting, Dempsey has caught not only the iridescent beauty of the small bird but he has captured, in the scene, the pure essence of a summer day when the flowers are in bloom, a soft breeze wafts through the trees and the world is good. As is his custom, Dempsey has included the rebus type image of a hidden hummingbird in the painting.